The years following ROTJ, Star Wars-related anything became increasingly hidden from the mainstream, and fans were often forced to wear out their VHS copies of the films to keep fandom alive. It’s was to no one’s surprise then, that the release of Timothy Zahn’s trilogy of books in the early 1990s caused an awakening of the Force and cash registers everywhere. When I first began reading the Zahn novels (a/k/a “The Thrawn Trilogy”) in 1992, I was swept up not only by Zahn’s imagery, but by the sheer fact there was a new Star Wars adventure to dive into. Despite some minor undesirable story points, the popularity of Zahn’s series not only quenched the thirst of a parched fan base, but also served as the launching bay for an onslaught of new and (sometimes) exciting adventures in the Star Wars galaxy. Following the Zahn trilogy, the volume of Star Wars based books that hit the market eclipsed the girth of a baby Dewback. In less than twelve parsecs, fans went from limited options to a level of B. Dalton dominance that even Palpatine himself would be proud of. But, like the construction of the Death Stars (and for that matter, Starkiller Base), there were oversights made - not all the books kept in mind the adventures portrayed in other works. Thus, there was a challenge with some of the storylines. Among them: How major characters in one storyline be completely dismissed in others? Not to mention, some of the stories themselves became absurd, and often times seemed more like fan fiction than the work of a professional author. Nonetheless, this embracing of Star Wars stories filled a longtime void in the hearts of millions of fans - before the dark times. Before, the (Disney) empire. Those whom fell into the latter, often took the news like a close friend or loved one had died (Picture: Obi-Wan grasping his chest when Alderaan is destroyed). Only this time, those millions of voices who suddenly cried out, refused to be silent. Many took to social media to announce their extreme dissatisfaction (if only there would be such an outcry for things like education, homelessness, etc.!) with Disney’s decision, and some continue to be heartbroken over the loss. 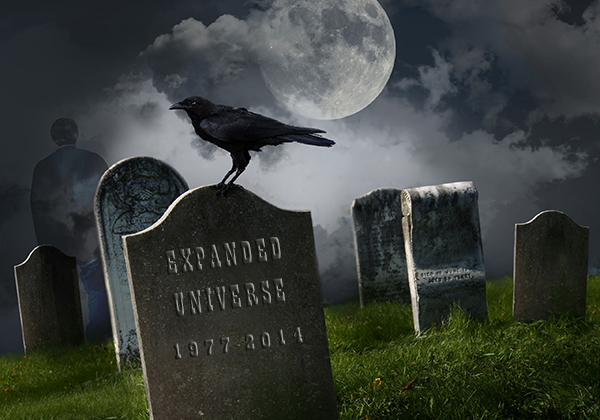 Stage 1: DENIAL When news hit of the demise of the Expanded Universe, some fans may have reacted with strong disbelief: "Wait. What!? No way." At this point, nearly two years later, it’s likely most EU fans have worked through this stage and are no longer able to hide in the shadows of denial. They realize Star Wars “canon” is indeed a fact. Stage 2: ANGER As the news was confirmed, and reality of the loss set in, some EU lovers felt betrayed, uttering phrases like, "F* Disney! ", and vowing to never partake of any Disney-produced Star Wars items. While this phase is necessary and understandable, it is also the one that tends to last the longest, and/or the one that EU fans return to when discussions of Star Wars canon are brought up. (The latter is particularly helpful to understand if you ever have the desire to pour salt into a wounded EU fan). Stage 3: BARGAINING As the rage mellowed over time, there became a glimmer of (false) hope: "Maybe they'll use some parts..." This was very popular around the time of Celebration, in Spring 2015, when details of TFA were still a mystery. There was hope the new film would include Thrawn or Mara Jade, since they are arguably the EU’s most notable and well-written characters. Evidence for this bargaining stage of the coping cycle continues today, with the speculation (or perhaps hope) that Supreme Leader Snoke is Darth Plagueis, since the character himself is canon, but the book featuring his name is not. Stage 4: DEPRESSION Then, as the realization of a greatly-condensed official storyline sunk-in, there was the inevitable period of "I don't know what I'm going to do, now that ___ is gone..." Depression is caused by the understanding that what was once reality is now gone, and the uncertainty of how to deal with the loss. It’s the inability to get overly excited about new Star Wars content because the loss of beloved content dominates the mind. It’s like trying to date someone new right after breaking-up with a longtime lover. (The irony, of course, comes in realizing that even the canonical work is, well, made-up). Stage 5: ACCEPTANCE While some EU fans have not yet completed the cycle, those who have simply exhale a sigh of acceptance, embrace the memories, and reflect on the beauty of a once-wonderful relationship: "I'll always love Thrawn..." It’s much like what happens when you come to the realization that your childhood is behind you, and the bland world of adulthood is your new reality: you reflect fondly and remember a sweeter time, while accepting that the past is just that - the past. This, of course, begs the question - where do you fit into this cycle? Are you an EU fan that continues to walk the road of coping, or did you simply shrug your shoulders at Disney’s decision and look forward to the rebirth of the film series? What does the death of the EU mean to you?